Improve your business, improve your service and keep your customers happy. RealTime feeling intelligence that touches and connects your customers experience with action. Sign up to get your account ready and download the app to any iOS / Android tablet and start checking your customer feeling in less than 5 minutes. You don’t have to waste time on resources, our powerful analytic cloud does the hard work for you, analyze all your customers feelings in one place and take action based on real-time intelligence. Integrate new sources of feelbacks and business intelligence tools for cross-analytics with your enterprise data, with our integration api. Control what question is prompted to the customer or employee, change it any time, analyze the data in real time. If a Normal or Bad feel is given, you may ask the user to clarify better their feeling with Clarify Feeling. All from your online account. Control from your online control panel, when the FeelTerminals should go to sleep mode, taking full advantage of energy savings. 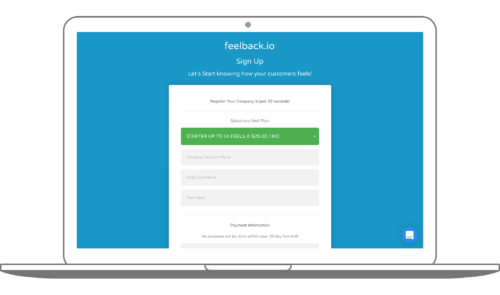 Offer your online / offline customers with a way to feelback your business. Our high design and quality terminal let’s your customers feelback your business. With a simple code in your website you enable your web users to feelback your website. With a simple code you may add to your outbound emails our feelsmiley that will give to your users a easy to clic to help you qualify your content. Our easy to use App can be installed in any Andoid/iOS tablet and make your own Feelback Terminal. 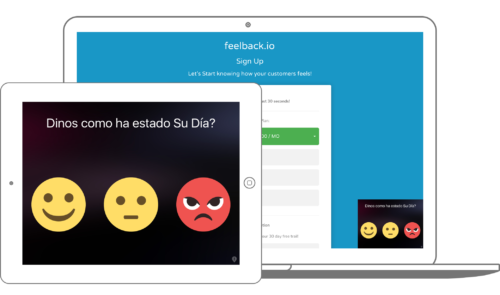 Our step by step to start measuring how your customers or employees feel! Step 1 - Sign up to setup your account! 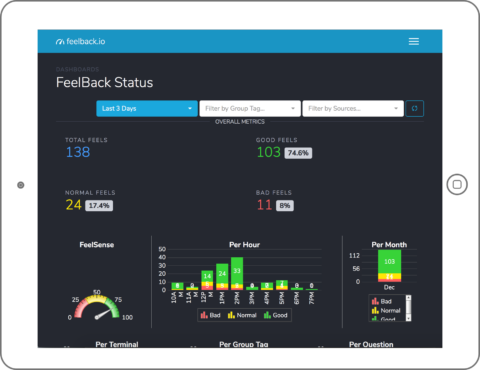 To start measuring how your customers or employees feel with your store or office you must sign up for a feelback account. Once you sign up for your account you will be sent your temporary sign in password, with this password you will be able to sign in to your account. Remember you will be asked for a credit card (Master Card/Visa), but no charge will be done until you have a active source for more than 15 days. Once you are sign in to feelback.io dashboards you will have to add a source. Source can be your own tablet with our FeelBack app, a FeelTerminal delivered by us, or FeelWeb and FeelMail installed in your website or OutBound Emails. Feel free to add as many sources you need, but remember each one counts as a valid source for your monthly invoice. Each active source counts for your monthly invoice, you can add as many sources you need and remove them as you like, we will only charge the days your active sources where running! Build a strong business as you considere in your decisions the key metric of keeping a healthy environment for your customers and employees.